I previously blogged about this plant in 2009 and it just looks so good this year I wanted to blog about it again. This will be a picture heavy post. 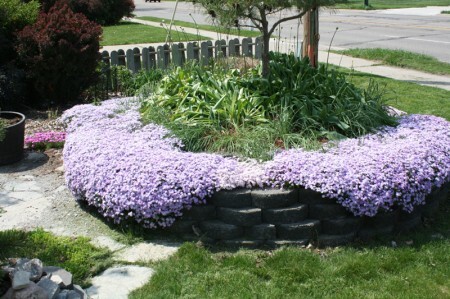 Creeping phlox, also called carpet phlox, phlox sublata is a great typically evergreen groundcover native to the eastern US. It spreads, yet is easy to control, seems to tolerate a variety of soils and drought, and puts on a really showy display of flowers in the Spring. 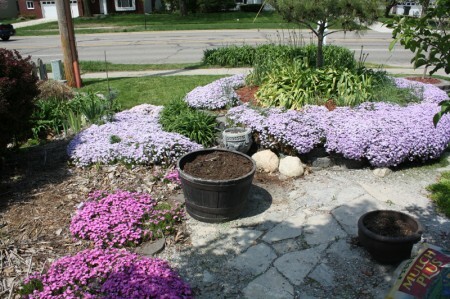 I originally had bought and had used ice plant as a ground cover for most of the locations where I now use phlox, and while the ice plant did flower for a longer period (nigh all summer), it eventually petered out and died (soil or climate, it was only marginally hardy here in Michigan). Phlox so far has performed much better. My favorite way to use it, as is self evident is having it cascade down rock or brick walls, over your raised beds, making them seem as if they’re a cauldron bubbling over. 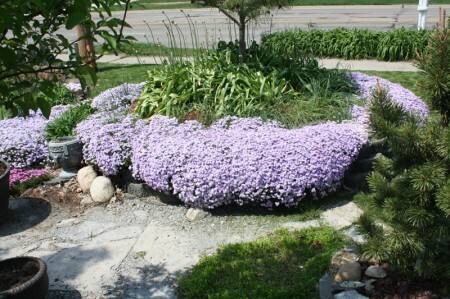 I have not, however, had equal success with all cultivars or varieties of creeping phlox. I originally planted three: Emerald Pink, Emerald Blue, and Candy Stripe (white with red stripes). Emerald Pink holds its own, flowers nicely, and spreads moderately. Emerald Blue by far grows the best, flowers the most, spreads the most (though still controllable) and all told is the healthiest of the lot. Candy Stripe is a severe disappointment, it constantly exhibits signs of drought stress, barely grows, barely spreads, and in many locations has just failed. In some places I’ve planted these three side by side and the blue has ended up taking over while the candy stripe fades away. If you’re looking to purchase a phlox, do not get Candy Stripe. A good example of this can be found by comparing my picture from my 2009 post, with one I took just today, around 4 years later. I didn’t do anything, just let the plants grow, and grow Emerald Blue did. You can see it has just taken over, the Pink is holding its own, but Candy Stripe has been left in the dust. Also notice the lilies poking up from within the phlox. Isn’t that neat? It is a ground cover but it isn’t going to smother other plants, so it can freely climb over them. 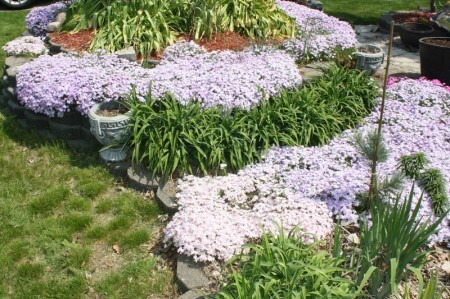 Candy Stripe Creeping Phlox, in the middle, grows poorly compared to the variety on the sides. In the above picture, and again in the below one, you can see just how poorly the Candy Stripe grows. They were all originally planted at the same size, in both these pictures the Candy Stripe is centered and has barely grown, whereas the Emerald Blue has taken off. Candy Strip,e in the middle, grows much less vigorously. I’ve only had two problems with this plant. One winter I had some die back, well one problem, possibly two causes. It was a very cold winter and some of the tips exposed drooping down off the bricks got zapped, I’m not sure if it was the cold though, rodents had also been chewing on stems further up the plant and that may have done it. The plant is normally evergreen though, so it became obvious when it got all brown that something had happened. It quickly recovered though, as you can tell. All told, I still highly recommend this plant. Hi i have tried growing this in southern calirfornia and i havent had good results any idea how we can grow them in the LA area? I love this plant. It almost reminds me of a water feature. I’m not quite sure how I put the two together, but it’s there! Not to mention it’s a great space filler while being pleasing to the eyes. Great pictures. Thank you for posting this. That’s beautiful, it’s like a sea of flowers. 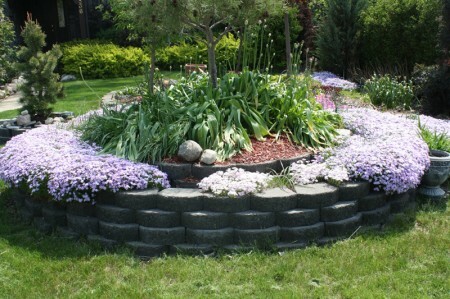 The raised bed looks wonderful with the flowers overflowing the sides. 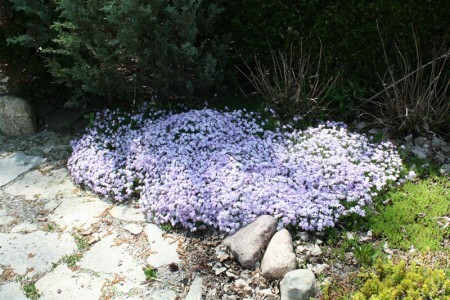 I love creeping phlox – so beautiful and an early bloomer. Makes spring so much more beautiful!! Those are beautiful! 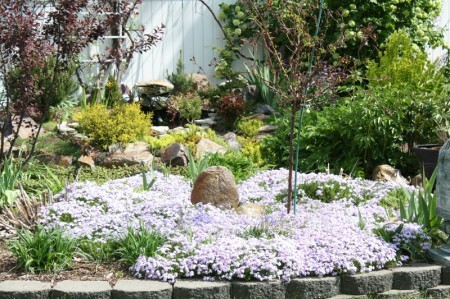 I love creeping phlox, I wish I had more space in my yard for them. 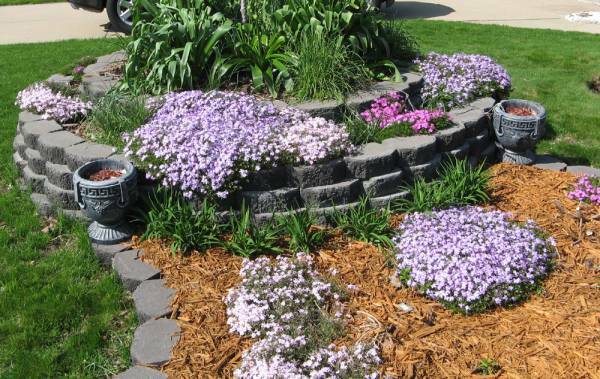 Those are some great ideas for utilising creeping phlox. I never thought I’d see beauty is seeing someone’s misfortune in a photo. Your current ice/snow photos are beautiful. I’m located in southern California and I don’t get to see such things. I’m always interested in how folks East of the Rocky Mountains garden during Winter months and how they ready for Spring. Dangling ice cycles are my favorite. I know how anxious you must be to getting out there to start preparing for planting season. We’re fortunate here in southern California to have long growing seasons and our Spring comes in February / March. I actually feel bad about telling you that I planted sweet corn last week and today I planted more radish, lettuce, onion etc. My tomato and bell pepper seedlings are nearly 1/2″. What we don’t have here and I envy you.. is the vast colours form the changing of the seasons. California is diverse in climate and geography but, you have to get in the car and drive to a different elevation than you or go inland or coastal etc. California has extreme climates within miles from another. You’re lucky to be able to walk out your door.